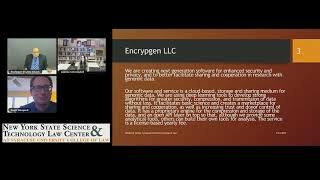 UB alumnus David Koepsell is co-founder of EncrypGen, Inc., along with his wife and co-founder, Dr. Gonzalez, a genomics scientist. Why blockchain? What's the value to genomics? How did you get interested in the technology? Where is the technology going? I think that it is an exciting evolution of database technology that solves some problems relating to data integrity and ability to audit, and the encryption involved can help with data privacy and security. Its role in our genomics solution is in providing a payments solution through our cryptocurrency called $DNA, so that researchers can connect with data sellers and buy data for use in studies. As well, our permissioned blockchain serves as a means of data monitoring for searches and sales, and to track exchanges. The genomic metadata is also put on the blockchain to provide a means of search without interrogating the raw data, adding a layer of security and privacy. I personally became interested in blockchains because of my interest in the ontology of money, and began as a blockchain hobbyist mining several different blockchains. Dr., Gonzalez, my wife and co-founder, is a genomic scientist and we have collaborated on issues of genomic data privacy. Combining these interests and expertise we decided to try to build a product to help scientists find and get data, and to help empower subjects to take charge of their own data. I think after the mania phase passes, blockchains will become a regular and respected part of many data solutions where privacy, security and audit trails are important, especially also where payment is necessary. David is an entrepreneur, author, philosopher, attorney (retired) and educator whose recent research focuses on the nexus of science, technology, ethics and public policy. He is the founder and CEO of EncrypGen, LLC. He has provided commentary regarding ethics, society, religion and technology on: MSNBC; Fox News Channel; The Guardian; The Washington Times; NPR Radio; Radio Free Europe; Air America; The Atlanta Journal Constitution and the Associated Press, among others. He has been a tenured Associate Professor of Philosophy at the Delft University of Technology, Faculty of Technology, Policy and Management in the Netherlands; Visiting Professor at UNAM, Instituto de Filosoficas and the Unidad Posgrado, Mexico; Director of Research and Strategic Initiatives at Comision Nacional de bioetica in Mexico; and Asesor de Rector at UAM Xochimilco. He also serves as an adjunct professor with the UB Dept. of Learning and Instruction. 1997—PhD, Philosopy, UB, with a dissertation: The Ontology of Cyberspace: Law, Philosophy and the Future of Intellectual Property.